1) in the Leaf 2018 what is the Vc capacity into the Inverter PWM? and what is its function? 2) the block composed of: the resistance for the dynamic dissipative breaking + GTO switch, with in parallel the capacity. Is it inside the BMS - Battery Management System? eletech wrote: 1) in the Leaf 2018 what is the Vc capacity into the Inverter PWM? and what is its function? From the schematic, it appears Vc is simply the battery voltage available to the H-bridge that drives the motor. 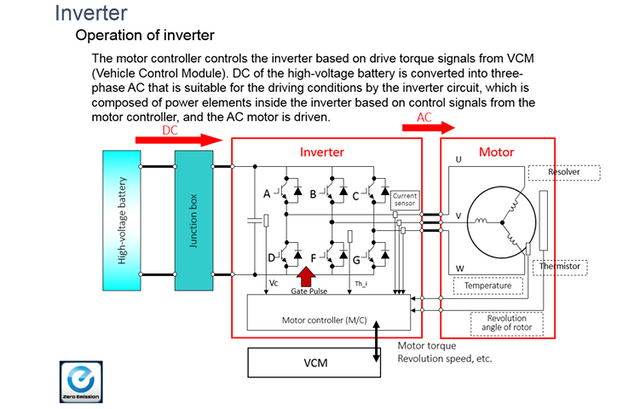 It appears the value of Vc is available to the motor controller, probably so it can adjust its control as the voltage drops due to lower SOC or high demand. eletech wrote: 2) the block composed of: the resistance for the dynamic dissipative breaking + GTO switch, with in parallel the capacity. Is it inside the BMS - Battery Management System? I'm not really sure what you mean by this but the motor braking (regen) is almost certainly dynamic braking and not dissipative. In this case the motor controller will reverse the current flow to turn the motor into a generator and the current will flow back into the battery. In cases where no regen is available (eg when the battery is at 100% SOC) the motor controller will just coast the motor instead of applying a dynamic brake. As a side note, this schematic seems simplified to my eyes as it looks like a standard H-bridge driving a 3-phase motor. For some reason, I thought the motor controller was more sophisticated and involved lots of phase angles and such.